100 x 65 mm. – 75 leaves, with 1 six-line miniature, 8 painted heraldic representations, 1 historiated initial, 34 ornamented frames, 29 of which historiated, 16 full-page illuminated miniatures. Written in several scripts and painted by brother Pieter Engel at Heverlee abbey, 1582. 100 x 65 mm, 75 leaves, 8 painted heraldic representations, 34 ornamented frames, 16 full-page illuminated miniatures. Made 1582, at Heverlee Abbey (near Louvain) by Petrus Angeli or Pieter (van) Engel(s) perhaps for himself or as a presented ‘masterpiece’ to illustrate his abilities, made during the lifetime of Philip III of Croy (d. 1595), for the memorial of the Knight of the Golden Fleece depicted on fol. 45. The calligrapher and illuminator of the present manuscript, who prepared his texts and painting on mostly quires made of two bifolia, must have been trained professionally and shows himself to be a qualified artisan. He proclaimed his name in the colophon heading the booklet (fol. 6v) as a professed monk at the Celestine abbey at Heverlee: Scripsit et pinxit f[rater] Petrus Angeli professione & ordine coelestinorum prope Lovanium, or: ‘written and painted by brother Pieter Engel, professed and of the order of Celestines near Louvain’. 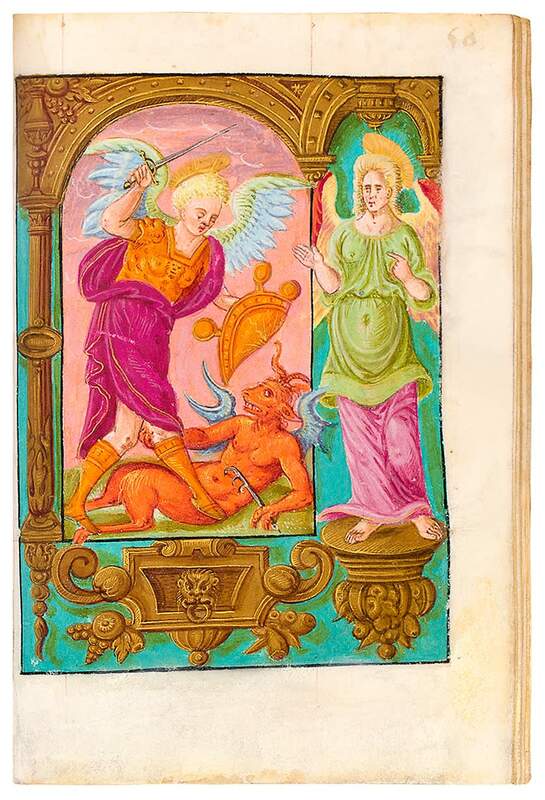 This work is now in the collection of the Universiteitsbibliotheek in Leuven, where it has been fully digitised. Access to the work can also be gained on the FLANDRICA.be site.